Far be it from me to demand that the creative team of Nick Spencer and Steve Lieber be the driving force behind every single issue of Superior Foes of Spider-Man from now until its inevitable (and unfortunate) cancellation a few months from now. But when we get issues like last week’s Superior Foes #10, I get mighty tempted to publicly say “pretty, pretty please with a cherry on top” to whoever is listening out there in Marvel-land to make sure that Spencer/Lieber don’t take any more breathers for the foreseeable future. In Superior Foes #10, James Asmus scripts and a quartet of pencillers (Carmen Carnero, Nuno Plati, Siya Oum and Pepe Larraz) fill in for Spencer/Lieber in an unashamed standalone issues that’s even titled “Filling In.” Points should be given for Superior Foes remaining so meta and self-aware, even when the primary creative duo is not involved with a specific issue. But that doesn’t change the fact that true to its name, the comic was different in terms of its tone from its predecessors and just didn’t delight me the way Superior Foes traditionally does. With Boomerang hanging out with his new girlfriend and playing the Chameleon and Owl off each other, and with Shocker ordering pizzas for the disembodied head of Silvermane, Superior Foes #10 uses this break in the action to take a look at some funny moments starring the other three members of the Sinister (not) Six, Overdrive, Lady Beetle and Speed Demon. Similar to my complaints about the Lady Beetle-centric Superior Foes #7 a few months ago (which was written by Spencer, but illustrated by Rich Ellis), these issues that serve as a break in the broader Boomerang-led heist narrative stop the flow and fun of this series dead in its tracks. Part of my overall issue with this comic stems from how Asmus characterizes his three main villains. When Superior Foes started, I totally anticipated that each villain would “star” in a designated issue, but found myself pleasantly surprised to be wrong about the fact that Boomerang was the chief voice of this series. Spencer and Lieber have created a compelling, undeniably entertaining protagonist in Boomerang, and his voice is something I want to return to every time out. As a result, in Superior Foes #10, I couldn’t help but find myself comparing the narrative voices of Overdrive, Beetle and Speed Demon to Boomerang. And I’m sure you can imagine that once you sit there and start comparing something to its predecessor, that’s not a recipe for success. The million dollar question is what did we actually learn about these three villains that should enhance my opinions of them as this series marches to its end? 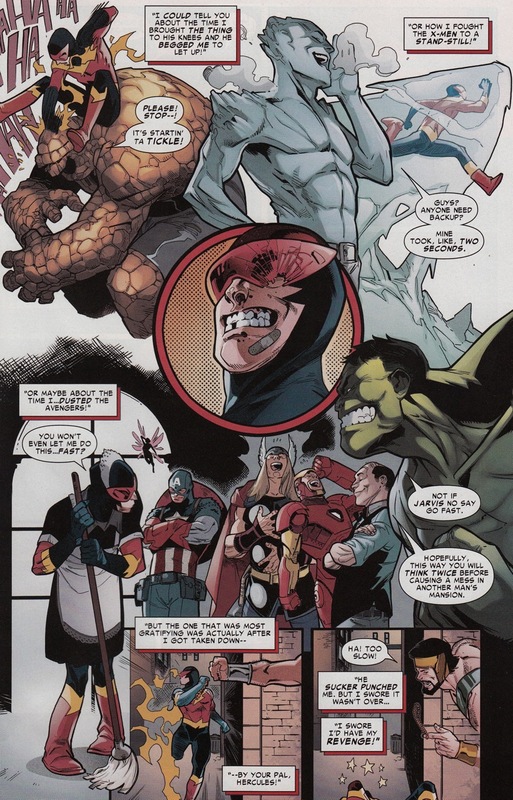 Overdrive, Beetle and Speed Demon all shares stories about their greatest victories against established Marvel heroes, but there’s nothing special or unique about the way these tall tales evolve. Overdrive is revealed to be a coward when he has a confrontation with Hercules and we learn that he always wears his helmet now to hide his identity from the powerful demi-god. 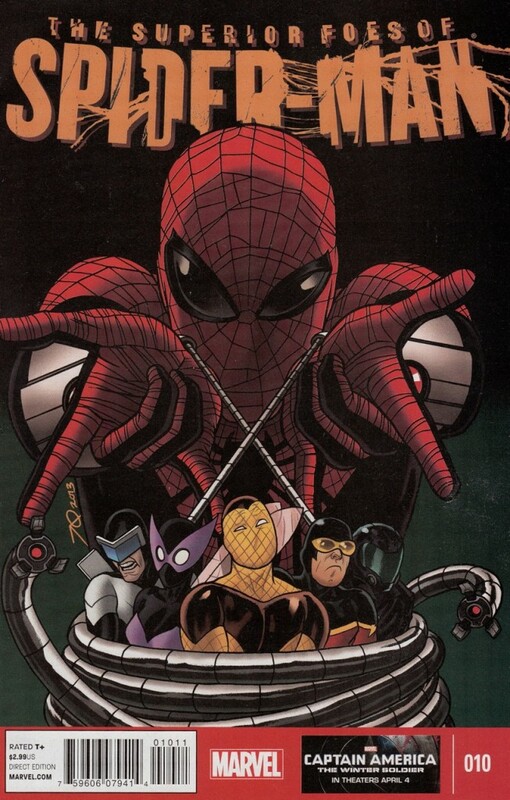 But the Sinister Six already has its token coward (at least in terms of how Spencer/Lieber portray the team) in Shocker. So do we really need two guys now who can potentially pee themselves when the heat is on (as the ending of Superior Foes #10 suggests). The same can be said for Speed Demon. 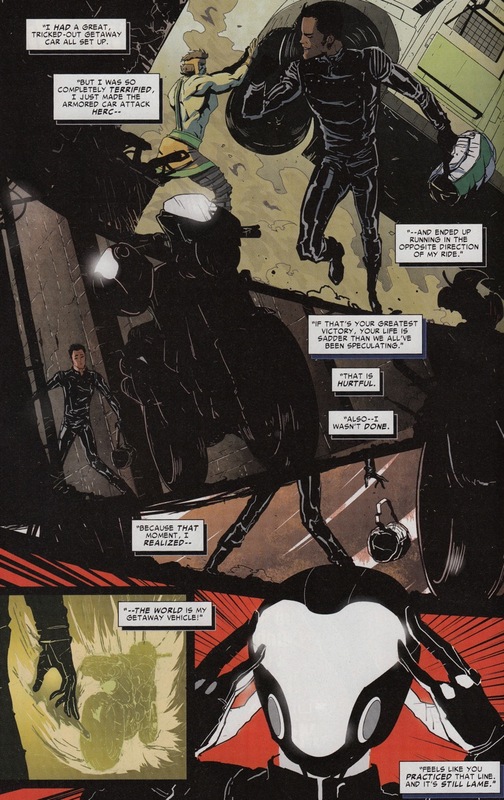 We are offered a funny visual of Speed Demon saying one thing about his confrontations against various heroes, but physically doing something very different. I.e., he “dusts off” the Avengers when he actually is forced to put on a apron and dust the Avengers Mansion. Again, I chortled a bit when reading it, but isn’t this the same kind of unreliable narrator schtick we get on a much more sophisticated level from Boomerang? The only character in this issue that Asmus offers us any legitimate insight about is the Beetle. 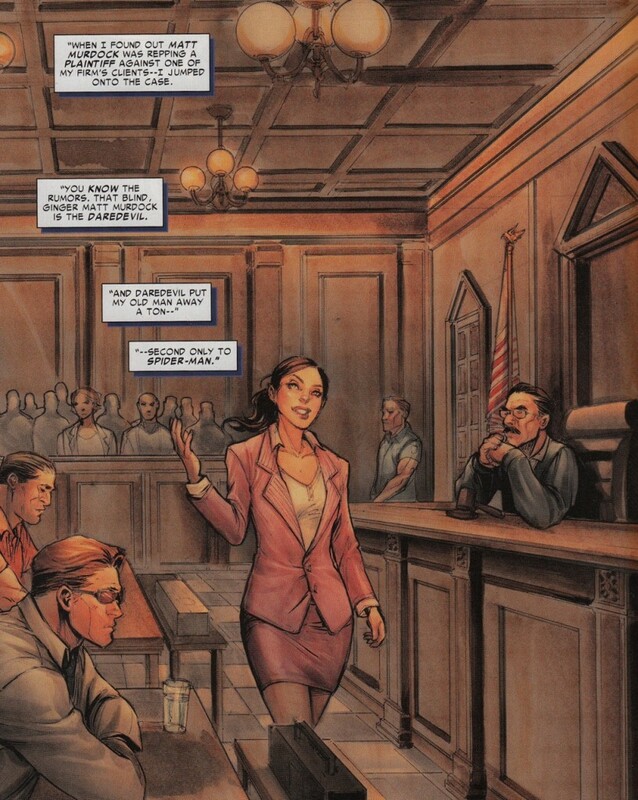 In her story, she’s able to win a legal case against Matt Murdock after she hires the Looter to cause some havoc outside the courtroom, drawing Murdock out as Daredevil. A later scene of the Looter rejecting Beetle’s offer to join forces (telling her “she’s the competition” now) shows how naive Janice can be (validating the concerns of her father, Tombstone). This is certainly a personality trait that Spencer and Lieber can come back to with interesting results. Whats makes u think the series is getting cancelled? Its funny as hell! Why would marvel cancel such a great series? The series creators themselves believe the series is going to be cancelled after issue #15. It could just be relaunched like all the other titles. Yes its annoying as hell, but at-least the same creative team will remain on the book. That’s just my theory anyway.